Director/Screenplay – Pascal Laugier, Producer – Kevin DeWalt, Scott Kennedy, Jean-Charles Levy & Clement Miserez, Photography – Kamal Derkaoui, Music – Todd Bryanton, Additional Music – Joel Douek & Christopher Young, Visual Effects Supervisor – Mark Savela, Visual Effects – Bluefilmproduction (Supervisors – Nicolas Lim & Celine Sene), Minds Eye Entertainment Ltd., Red Hat Studios, Switch VFX (Supervisor – Jon Campfens), Special Effects Supervisor – Paul Noel, Production Design – Jean Carriere. Production Company – Minds Eye Entertainment/Radar Films/Forecast Pictures/SND/Highwire Pictures/Iron Ocean Films/Canal +/M6/Super Channel. The tiny town of Cold Rock, Washington has fallen on hard economic times. Its’ people are terrified by a figure that has been nicknamed The Tall Man who abducts the town’s children at regular intervals. Widow Julia Denning is a nurse who runs a free surgery in the town. She is woken by noises in the night to find that her adopted son David is the latest child to be abducted. She gives pursuit to her abductor’s vehicle but is injured. As the townspeople come to her aid, she becomes aware that they are engaged in a conspiracy and have abetted the abduction. She flees, seeking to find where David has been taken. However, nothing that she discovers and nothing about The Tall Man is what it seems. French director Pascal Laugier has become one of the most intriguing genre names to emerge in recent years. Laugier made his directorial debut with the Christophe Gans produced ghost story Saint Ange (2004), a film of directorial promise but confusing script. It was however with the unique and extraordinary Martyrs (2008) that people began to notice Laugier’s name. It was a film that pushed the so called new ‘French Extremism’ to its most torturous limits and has turned up on several Best Horror Films of the 2000s lists. Laugier was for a time associated with the long touted remake of Hellraiser (1987) but departed the project (about the same time that it was announced it was being made for a PG-13 rating). The Tall Man was his third film and he subsequently went on to make the equally reality bending home invasion film Ghostland/Incident in a Ghostland (2018) . The Tall Man is one of the most head-spinning films that one has seen in some time. (I am not entirely sure if I mean that in either a good or a bad way). The film opens on Jessica Biel, battered, with one eye swollen and pieces of glasses being picked out of her face by a doctor as she is being comforted by Stephen McHattie’s FBI agent who says “we haven’t found him. Or any of the others”, where the impression we get from the scene is that her son has been abducted. It is important to remember these seemingly innocuous details as the scene provides complete misdirection for the entire film to follow. The film then flashes back 36 hours to the start of events. There we observe the ordinariness and backwater poverty of the town. Jessica Biel is painted as a sincere and caring nurse. (Indeed, this is one of the best performances that Jessica Biel has given. She has mostly seemed a blandly pretty face out of her depth in films such as The Illusionist (2006), I Now Pronounce You Chuck and Larry (2007) and Next (2007). Here she plays plain, without glamour makeup and determines to do some serious acting – she even executive produces the film). Pascal Laugier starts to generate considerable tension when the abduction of David begins. Jessica Biel is woken by noises in the house, initially seeing nothing, only to turn and find the maid (Eve Hallow) bound and gagged in the pantry. She races upstairs to David, just as the hooded figure of the Tall Man escapes, ending in an intensive chase as she struggles to get aboard the Tall Man’s van, even being dragged along behind it, being attacked by the Tall Man’s dog and made a prisoner, before getting free. Up until this point, Pascal Laugier has done a fine job letting us believe that we are seeing a film where a small town is plagued by a mysterious, possibly even supernatural figure known as The Tall Man who abducts their children, and that Jessica Biel’s son is the latest to be abducted. However, it is important to know that everything you initially think is happening in the film and all the places that our sympathies are being drawn is in fact blatant misdirection. [PLOT SPOILERS] Things start to get strange when Jessica Biel is brought back to the diner. As she is tended, it becomes apparent that the townspeople are engaged in a conspiracy of some type. She makes an escape and follows the trail to a disused mine where David is being held to encounter The Tall Man who happens to be a woman (Colleen Wheeler). In the first of the film’s head-spinning turns, we see that David is now referring to Wheeler as his mother. As Jessica returns home with David, there are constant hints and suggestions of something sinister happening – Jodelle Ferland’s mute teenager warning Jessica Biel that Eve Hallow “called Him” and we then seeing Hallow in the kitchen with David and producing a syringe, Biel then telling Hallow “Jenny knows”, before in the next abrupt spin the police and FBI raid the house and Biel is arrested, while it is found that Eve Hallow has hung herself. Even at this point, the film is still misleading us. A battered Jessica Biel as a mother dealing with the abduction of her child. Or is that what is really happening? [PLOT SPOILERS] Eventually in the last quarter, the film reveals that Jessica Biel has been part of a scheme to abduct children and take them to better homes away from their impoverished and abusive smalltown environment. (The Tall Man is a film that is best not to dwell on the classist notion it makes about the inherent superiority of well-off families and the casual assumption that it is better to abduct children from underprivileged circumstances). It is during the police interrogation scenes that we see everything has been spun on its head – Jessica Biel is part of a child abduction railroad; David is not her son but a boy she took from an abusive home environment; what we thought was his abduction by the Tall Man was in fact his birth mother trying to rescue him; indeed, there may not even be any Tall Man outside of Jodelle Ferland’s voiceover description. The end the film goes out on with Jessica Biel accepting the role of the martyr to the cause and being regarded as the boogie person contains some striking writing. You can see in these revelations that Pascal Laugier has done a tweak of audience perception of that goes way above and beyond the conceptual manipulations and left field surprise revelations that M. Night Shyamalan conducted in films like The Sixth Sense (1999) and The Village (2004) and the numerous films that sought to copy this. 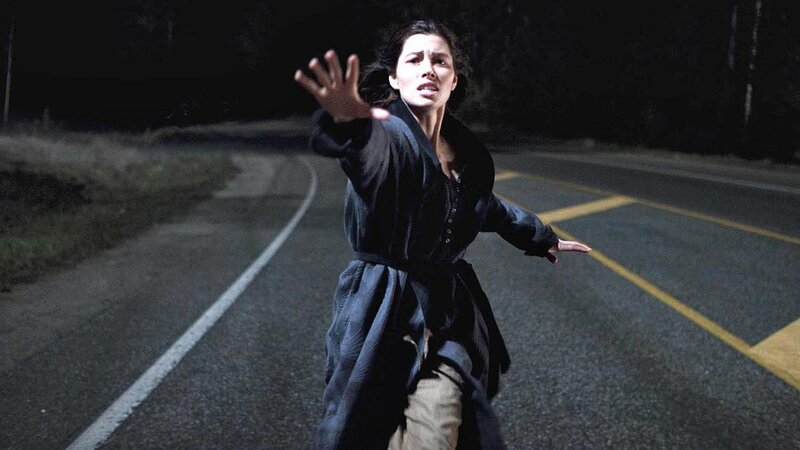 Everything from the image presented of Jessica Biel as a battered and suffering mother in the opening moments to the build-up surrounding a boogeyman known as The Tall Man has been pulled over our eyes. There is a feeling of annoyance at the degree to which Pascal Laugier has misdirected us – he did very similar games in the early sections of Martyrs and in the subsequent Ghostland. That said, you cannot deny the ingenuity of the head-spinning turns the film whips us through. (Nominee for Best Original Screenplay at this site’s Best of 2012 Awards).